What role should government play in assisting young people entering farm businesses? Here’s how our changing climate is affecting Canadian agriculture. This Canadian has significantly influenced agriculture. CYSA was proud to have welcomed His Excellency, The Honourable David Johnston, The Governor General of Canada, to the presentation theatre. 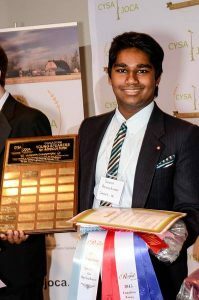 Junior CYSA winner Denesh Peramakumar was honoured to present his winning speech to His Excellency after which The Governor General encouraged questions and discussion from competitors during a question and answer period. 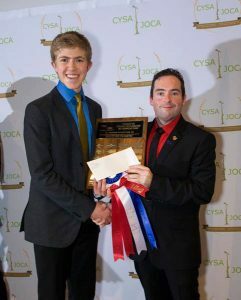 Each year the renowned public speaking competition is held at the Royal Agricultural Winter Fair in Toronto. The competition is open to youth ages 11 to 24 with a passion for agriculture whether raised on a farm, in the country or in the city.